My name is Tori Codona. I have had ankylosing spondilitis. The summer that I was 22, I started having a lot of back pain that would travel into my buttocks, hips, and legs. I saw numerous doctors over the years. I got told many different things about my back problems…..possible disc problems. siatica ect. In 2009 (at age 43) I was going through a lot of stress in my marriage and began having iritis flares. After I had two, my eye doctor told me that one more and he wanted me to be tested for arthritis. The PA that I see was saying the same thing. So, after the 3rd flair in a few months, they scheduled me for blood tests, including the HLA-2b7. My PA called me as soon as she got the results that tested positive. She said that she wanted to send me to a rhumatologist. By this time, I was also in the process of a divorce. A couple of weeks later, I had my first consult at the office of Dr. Steven Atcheson. I first saw Kimberly, the PA in his office. She gets all your information and orders the tests that they need to complete the diagnoses. More blood tests and spinal x-rays. She explained that there were a few things they were testing for with different treatment plans and gave me some pamphlets. After looking through the symptoms of AS, I was fairly sure that is what I had. When I returned for my visit with Dr. Atcheson, he looked at the results of the blood work, then at the x-ray and said “of course she has ankylosing spondilits” Look at the spine. I had waited 21 years for that diagnoses. I started on one oral medication that didn’t work for me. I told Dr. Atcheson, “NO INJECTIONS”. So we kept trying new things. I met a wonderful man and he started going to my doctors visits with me. He volunteered to give me the injections that I had been avoiding. I started on Simponi. After 3 months, I told Dr. Atcheson that it wasn’t helping. It didn’t make me feel any better than just taking the Etodolac. He said, let’s go for perfect and started me on Enbrel. That was in June, 2011. 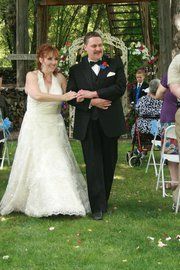 I got married to Jim Codona in July. And life is pretty great. I recently had someone say to me “Doesn’t it make you mad that you must have the pills and injections?” I said “No, I thank God that these medications are available to help me.” I spent a lot of years in too much pain to play with my children. Thomas and Emily heard too much, “I can’t, my back hurts”. The life I have now has a wonderful quality that I didn’t know I could have! Your story is a lot like mine, my diagnoses was thirty-two years in the making. I am thankful as you are for the medications available to us to help ease the pain and give us back a life that we can make the best of. Best of luck to you and thank you for sharing your story. Thank you for sharing. Beautiful wedding picture. I remember there were so many things I couldn’t do with my son before I was diagnosed and on medication. Now that he is older and I am not working, we try to do a lot together. He is 23. We learned about AS and disability as a family because it was just part of our lives. I am so happy you met someone who is supportive. It really makes a difference. Congratulations to you both! Very touching story. It leaves me hopeful for my son and my husband who both have AS. Thank you for sharing…..the part that hit me like a ton of bricks is the part where you said that your children heard “I can’t, my back hurts” too much. My kiddos are the same way – I do as much as I can!